Mercurial is a modern distributed version control system (VCS), written mostly in Python with bits and pieces in C for performance. In this chapter, I will discuss some of the decisions involved in designing Mercurial's algorithms and data structures. First, allow me to go into a short history of version control systems, to add necessary context. While this chapter is primarily about Mercurial's software architecture, many of the concepts are shared with other version control systems. In order to fruitfully discuss Mercurial, I'd like to start off by naming some of the concepts and actions in different version control systems. To put all of this in perspective, I will also provide a short history of the field. The first action, to get a local tree of files, is called a checkout. The store where we retrieve and publish our changes is called a repository, while the result of the checkout is called a working directory, working tree, or working copy. Updating a working copy with the latest files from the repository is simply called update; sometimes this requires merging, i.e., combining changes from different users in a single file. A diff command allows us to review changes between two revisions of a tree or file, where the most common mode is to check the local (unpublished) changes in your working copy. Changes are published by issuing a commit command, which will save the changes from the working directory to the repository. The first version control system was the Source Code Control System, SCCS, first described in 1975. It was mostly a way of saving deltas to single files that was more efficient than just keeping around copies, and didn't help with publishing these changes to others. It was followed in 1982 by the Revision Control System, RCS, which was a more evolved and free alternative to SCCS (and which is still being maintained by the GNU project). After RCS came CVS, the Concurrent Versioning System, first released in 1986 as a set of scripts to manipulate RCS revision files in groups. The big innovation in CVS is the notion that multiple users can edit simultaneously, with merges being done after the fact (concurrent edits). This also required the notion of edit conflicts. Developers may only commit a new version of some file if it's based on the latest version available in the repository. If there are changes in the repository and in my working directory, I have to resolve any conflicts resulting from those changes (edits changing the same lines). CVS also pioneered the notions of branches, which allow developers to work on different things in parallel, and tags, which enable naming a consistent snapshot for easy reference. While CVS deltas were initially communicated via the repository on a shared filesystem, at some point CVS also implemented a client-server architecture for use across large networks (such as the Internet). In 2000, three developers got together to build a new VCS, christened Subversion, with the intention of fixing some of the larger warts in CVS. Most importantly, Subversion works on whole trees at a time, meaning changes in a revisions should be atomic, consistent, isolated, and durable. Subversion working copies also retain a pristine version of the checked out revision in the working directory, so that the common diff operation (comparing the local tree against a checked-out changeset) is local and thus fast. One of the interesting concepts in Subversion is that tags and branches are part of a project tree. A Subversion project is usually divided into three areas: tags, branches, and trunk. This design has proved very intuitive to users who were unfamiliar with version control systems, although the flexibility inherent in this design has caused numerous problems for conversion tools, mostly because tags and branches have more structural representation in other systems. All of the aforementioned systems are said to be centralized; to the extent that they even know how to exchange changes (starting with CVS), they rely on some other computer to keep track of the history of the repository. Distributed version control systems instead keep a copy of all or most of the repository history on each computer that has a working directory of that repository. While Subversion was a clear improvement over CVS, there are still a number of shortcomings. For one thing, in all centralized systems, committing a changeset and publishing it are effectively the same thing, since repository history is centralized in one place. This means that committing changes without network access is impossible. Secondly, repository access in centralized systems always needs one or more network round trips, making it relatively slow compared to the local accesses needed with distributed systems. Third, the systems discussed above were not very good at tracking merges (some have since grown better at it). In large groups working concurrently, it's important that the version control system records what changes have been included in some new revision, so that nothing gets lost and subsequent merges can make use of this information. Fourth, the centralization required by traditional VCSes sometimes seems artificial, and promotes a single place for integration. Advocates of distributed VCSes argue that a more distributed system allows for a more organic organization, where developers can push around and integrate changes as the project requires at each point in time. A number of new tools have been developed to address these needs. From where I sit (the open source world), the most notable three of these in 2011 are Git, Mercurial and Bazaar. Both Git and Mercurial were started in 2005 when the Linux kernel developers decided to no longer use the proprietary BitKeeper system. Both were started by Linux kernel developers (Linus Torvalds and Matt Mackall, respectively) to address the need for a version control system that could handle hundreds of thousands of changesets in tens of thousands of files (for example, the kernel). Both Matt and Linus were also heavily influenced by the Monotone VCS. Bazaar was developed separately but gained widespread usage around the same time, when it was adopted by Canonical for use with all of their projects. Building a distributed version control system obviously comes with some challenges, many of which are inherent in any distributed system. For one thing, while the source control server in centralized systems always provided a canonical view of history, there is no such thing in a distributed VCS. Changesets can be committed in parallel, making it impossible to temporally order revisions in any given repository. The solution that has been almost universally adopted is to use a directed acyclic graph (DAG) of changesets instead of a linear ordering (Figure 12.1). That is, a newly committed changeset is the child revision of the revision it was based on, and no revision can depend on itself or its descendant revisions. In this scheme, we have three special types of revisions: root revisions which have no parents (a repository can have multiple roots), merge revisions which have more than one parent, and head revisions which have no children. Each repository starts from an empty root revision and proceeds from there along a line of changesets, ending up in one or more heads. When two users have committed independently and one of them wants to pull in the changes from the other, he or she will have to explicitly merge the other's changes into a new revision, which he subsequently commits as a merge revision. Note that the DAG model helps solve some of the problems that are hard to solve in centralized version control systems: merge revisions are used to record information about newly merged branches of the DAG. 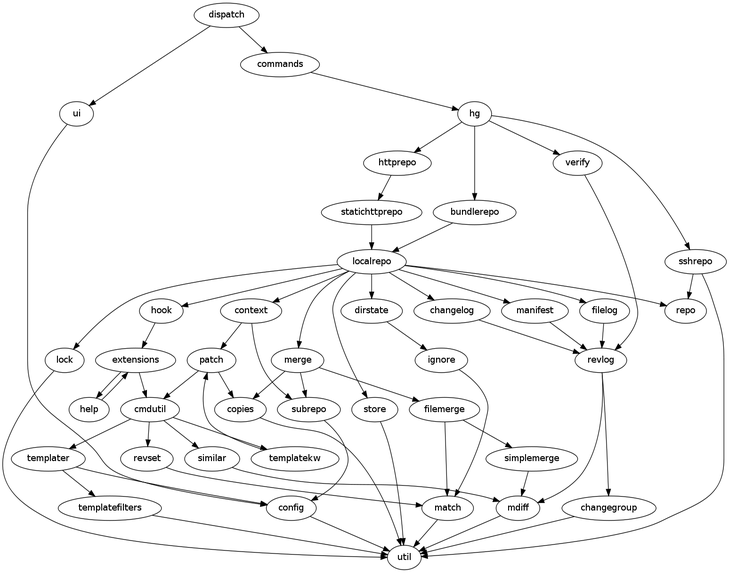 The resulting graph can also usefully represent a large group of parallel branches, merging into smaller groups, finally merging into one special branch that's considered canonical. This approach requires that the system keep track of the ancestry relations between changesets; to facilitate exchange of changeset data, this is usually done by having changesets keep track of their parents. To do this, changesets obviously also need some kind of identifier. While some systems use a UUID or a similar kind of scheme, both Git and Mercurial have opted to use SHA1 hashes of the contents of the changesets. This has the additional useful property that the changeset ID can be used to verify the changeset contents. In fact, because the parents are included in the hashed data, all history leading up to any revision can be verified using its hash. Author names, commit messages, timestamps and other changeset metadata is hashed just like the actual file contents of a new revision, so that they can also be verified. And since timestamps are recorded at commit time, they too do not necessarily progress linearly in any given repository. All of this can be hard for people who have previously only used centralized VCSes to get used to: there is no nice integer to globally name a revision, just a 40-character hexadecimal string. Moreover, there's no longer any global ordering, just a local ordering; the only global "ordering" is a DAG instead of a line. Accidentally starting a new head of development by committing against a parent revision that already had another child changeset can be confusing when you're used to a warning from the VCS when this kind of thing happens. Luckily, there are tools to help visualize the tree ordering, and Mercurial provides an unambiguous short version of the changeset hash and a local-only linear number to aid identification. The latter is a monotonically climbing integer that indicates the order in which changesets have entered the clone. Since this order can be different from clone to clone, it cannot be relied on for non-local operations. Now that the concept of a DAG should be somewhat clear, let's try and see how DAGs are stored in Mercurial. The DAG model is central to the inner workings of Mercurial, and we actually use several different DAGs in the repository storage on disk (as well as the in-memory structure of the code). This section explains what they are and how they fit together. Before we dive into actual data structures, I'd like to provide some context about the environment in which Mercurial evolved. The first notion of Mercurial can be found in an email Matt Mackall sent to the Linux Kernel Mailing List on April 20, 2005. This happened shortly after it was decided that BitKeeper could no longer be used for the development of the kernel. Matt started his mail by outlining some goals: to be simple, scalable, and efficient. Storage compression: what kind of compression is best suited to save the file history on disk? Effectively, what algorithm makes the most out of the I/O performance while preventing CPU time from becoming a bottleneck? Retrieving arbitrary file revisions: a number of version control systems will store a given revision in such a way that a large number of older revisions must be read to reconstruct the newer one (using deltas). We want to control this to make sure that retrieving old revisions is still fast. Adding file revisions: we regularly add new revisions. We don't want to rewrite old revisions every time we add a new one, because that would become too slow when there are many revisions. Showing file history: we want to be able to review a history of all changesets that touched a certain file. This also allows us to do annotations (which used to be called blame in CVS but was renamed to annotate in some later systems to remove the negative connotation): reviewing the originating changeset for each line currently in a file. The paper goes on to review similar scenarios at the project level. Basic operations at this level are checking out a revision, committing a new revision, and finding differences in the working directory. The latter, in particular, can be slow for large trees (like those of the Mozilla or NetBeans projects, both of which use Mercurial for their version control needs). The solution Matt came up with for Mercurial is called the revlog (short for revision log). The revlog is a way of efficiently storing revisions of file contents (each with some amount of changes compared to the previous version). It needs to be efficient in both access time (thus optimizing for disk seeks) and storage space, guided by the common scenarios outlined in the previous section. To do this, a revlog is really two files on disk: an index and the data file. The index consists of fixed-length records, whose contents are detailed in Table 12.1. Having fixed-length records is nice, because it means that having the local revision number allows direct (i.e., constant-time) access to the revision: we can simply read to the position (index-length×revision) in the index file, to locate the data. Separating the index from the data also means we can quickly read the index data without having to seek the disk through all the file data. The hunk offset and hunk length specify a chunk of the data file to read in order to get the compressed data for that revision. To get the original data we have to start by reading the base revision, and apply deltas through to this revision. The trick here is the decision on when to store a new base revision. This decision is based on the cumulative size of the deltas compared to the uncompressed length of the revision (data is compressed using zlib to use even less space on disk). By limiting the length of the delta chain in this way, we make sure that reconstruction of the data in a given revision does not require reading and applying lots of deltas. Link revisions are used to have dependent revlogs point back to the highest-level revlog (we'll talk more about this in a little bit), and the parent revisions are stored using the local integer revision number. Again, this makes it easy to look up their data in the relevant revlog. The hash is used to save the unique identifier for this changeset. We have 32 bytes instead of the 20 bytes required for SHA1 in order to allow future expansion. With the revlog providing a generic structure for historic data, we can layer the data model for our file tree on top of that. It consists of three types of revlogs: the changelog, manifests, and filelogs. The changelog contains metadata for each revision, with a pointer into the manifest revlog (that is, a node id for one revision in the manifest revlog). In turn, the manifest is a file that has a list of filenames plus the node id for each file, pointing to a revision in that file's filelog. In the code, we have classes for changelog, manifest, and filelog that are subclasses of the generic revlog class, providing a clean layering of both concepts. This is the value you get from the revlog layer; the changelog layer turns it into a simple list of values. The initial line provides the manifest hash, then we get author name, date and time (in the form of a Unix timestamp and a timezone offset), a list of affected files, and the description message. One thing is hidden here: we allow arbitrary metadata in the changelog, and to stay backwards compatible we added those bits to go after the timestamp. This is the manifest revision that changeset 0a773e points to (Mercurial's UI allows us to shorten the identifier to any unambiguous prefix). It is a simple list of all files in the tree, one per line, where the filename is followed by a NULL byte, followed by the hex-encoded node id that points into the file's filelog. Directories in the tree are not represented separately, but simply inferred from including slashes in the file paths. Remember that the manifest is diffed in storage just like every revlog, so this structure should make it easy for the revlog layer to store only changed files and their new hashes in any given revision. The manifest is usually represented as a hashtable-like structure in Mercurial's Python code, with filenames as keys and nodes as values. The third type of revlog is the filelog. Filelogs are stored in Mercurial's internal store directory, where they're named almost exactly like the file they're tracking. The names are encoded a little bit to make sure things work across all major operating systems. For example, we have to deal with casefolding filesystems on Windows and Mac OS X, specific disallowed filenames on Windows, and different character encodings as used by the various filesystems. As you can imagine, doing this reliably across operating systems can be fairly painful. The contents of a filelog revision, on the other hand, aren't nearly as interesting: just the file contents, except with some optional metadata prefix (which we use for tracking file copies and renames, among other minor things). This data model gives us complete access to the data store in a Mercurial repository, but it's not always very convenient. While the actual underlying model is vertically oriented (one filelog per file), Mercurial developers often found themselves wanting to deal with all details from a single revision, where they start from a changeset from the changelog and want easy access to the manifest and filelogs from that revision. They later invented another set of classes, layered cleanly on top of the revlogs, which do exactly that. These are called contexts. One nice thing about the way the separate revlogs are set up is the ordering. By ordering appends so that filelogs get appended to first, then the manifest, and finally the changelog, the repository is always in a consistent state. Any process that starts reading the changelog can be sure all pointers into the other revlogs are valid, which takes care of a number of issues in this department. Nevertheless, Mercurial also has some explicit locks to make sure there are no two processes appending to the revlogs in parallel. A final important data structure is what we call the dirstate. The dirstate is a representation of what's in the working directory at any given point. Most importantly, it keeps track of what revision has been checked out: this is the baseline for all comparisons from the status or diff commands, and also determines the parent(s) for the next changeset to be committed. The dirstate will have two parents set whenever the merge command has been issued, trying to merge one set of changes into the other. Because status and diff are very common operations (they help you check the progress of what you've currently got against the last changeset), the dirstate also contains a cache of the state of the working directory the last time it was traversed by Mercurial. Keeping track of last modified timestamps and file sizes makes it possible to speed up tree traversal. We also need to keep track of the state of the file: whether it's been added, removed, or merged in the working directory. This will again help speed up traversing the working directory, and makes it easy to get this information at commit time. Now that you are familiar with the underlying data model and the structure of the code at the lower levels of Mercurial, let's move up a little bit and consider how Mercurial implements version control concepts on top of the foundation described in the previous section. Branches are commonly used to separate different lines of development that will be integrated later. This might be because someone is experimenting with a new approach, just to be able to always keep the main line of development in a shippable state (feature branches), or to be able to quickly release fixes for an old release (maintenance branches). Both approaches are commonly used, and are supported by all modern version control systems. While implicit branches are common in DAG-based version control named branches (where the branch name is saved in the changeset metadata) are not as common. Originally, Mercurial had no way to explicitly name branches. Branches were instead handled by making different clones and publishing them separately. This is effective, easy to understand, and especially useful for feature branches, because there is little overhead. However, in large projects, clones can still be quite expensive: while the repository store will be hardlinked on most filesystems, creating a separate working tree is slow and may require a lot of disk space. Because of these downsides, Mercurial added a second way to do branches: including a branch name in the changeset metadata. A branch command was added that can set the branch name for the current working directory, such that that branch name will be used for the next commit. The normal update command can be used to update to a branch name, and a changeset committed on a branch will always be related to that branch. This approach is called named branches. However, it took a few more Mercurial releases before Mercurial started including a way to close these branches up again (closing a branch will hide the branch from view in a list of branches). Branch closing is implemented by adding an extra field in the changeset metadata, stating that this changeset closes the branch. If the branch has more than one head, all of them have to be closed before the branch disappears from the list of branches in the repository. Of course, there's more than one way to do it. Git has a different way of naming branches, using references. References are names pointing to another object in the Git history, usually a changeset. This means that Git's branches are ephemeral: once you remove the reference, there is no trace of the branch ever having existed, similar to what you would get when using a separate Mercurial clone and merging it back into another clone. This makes it very easy and lightweight to manipulate branches locally, and prevents cluttering of the list of branches. This way of branching turned out to be very popular, much more popular than either named branches or branch clones in Mercurial. This has resulted in the bookmarksq extension, which will probably be folded into Mercurial in the future. It uses a simple unversioned file to keep track of references. The wire protocol used to exchange Mercurial data has been extended to enable communicating about bookmarks, making it possible to push them around. At first sight, the way Mercurial implements tags can be a bit confusing. The first time you add a tag (using the tag command), a file called .hgtags gets added to the repository and committed. Each line in that file will contain a changeset node id and the tag name for that changeset node. Thus, the tags file is treated the same way as any other file in the repository. There are three important reasons for this. First, it must be possible to change tags; mistakes do happen, and it should be possible to fix them or delete the mistake. Second, tags should be part of changeset history: it's valuable to see when a tag was made, by whom, and for what reason, or even if a tag was changed. Third, it should be possible to tag a changeset retroactively. For example, some projects extensively test drive a release artifact exported from the version control system before releasing it. These properties all fall easily out of the .hgtags design. While some users are confused by the presence of the .hgtags file in their working directories, it makes integration of the tagging mechanism with other parts of Mercurial (for example, synchronization with other repository clones) very simple. If tags existed outside the source tree (as they do in Git, for example), separate mechanisms would have to exist to audit the origin of tags and to deal with conflicts from (parallel) duplicate tags. Even if the latter is rare, it's nice to have a design where these things are not even an issue. To get all of this right, Mercurial only ever appends new lines to the .hgtags file. This also facilitates merging the file if the tags were created in parallel in different clones. The newest node id for any given tag always takes precedence, and adding the null node id (representing the empty root revision all repositories have in common) will have the effect of deleting the tag. Mercurial will also consider tags from all branches in the repository, using recency calculations to determine precedence among them. Mercurial is almost completely written in Python, with only a few bits and pieces in C because they are critical to the performance of the whole application. Python was deemed a more suitable choice for most of the code because it is much easier to express high-level concepts in a dynamic language like Python. Since much of the code is not really critical to performance, we don't mind taking the hit in exchange for making the coding easier for ourselves in most parts. A Python module corresponds to a single file of code. Modules can contain as much code as needed, and are thus an important way to organize code. Modules may use types or call functions from other modules by explicitly importing the other modules. A directory containing an __init__.py module is said to be a package, and will expose all contained modules and packages to the Python importer. To be clear, Mercurial is a command-line application. This means that we have a simple interface: the user calls the hg script with a command. This command (like log, diff or commit) may take a number of options and arguments; there are also some options that are valid for all commands. Next, there are three different things that can happen to the interface. The start of this process can neatly be observed from the import graph in Figure 12.3. All command-line arguments are passed to a function in the dispatch module. The first thing that happens is that a ui object is instantiated. The ui class will first try to find configuration files in a number of well-known places (such as your home directory), and save the configuration options in the ui object. The configuration files may also contain paths to extensions, which must also be loaded at this point. Any global options passed on the command-line are also saved to the ui object at this point. After this is done, we have to decide whether to create a repository object. While most commands require a local repository (represented by the localrepo class from the localrepo module), some commands may work on remote repositories (either HTTP, SSH, or some other registered form), while some commands can do their work without referring to any repository. The latter category includes the init command, for example, which is used to initialize a new repository. All core commands are represented by a single function in the commands module; this makes it really easy to find the code for any given command. The commands module also contains a hashtable that maps the command name to the function and describes the options that it takes. The way this is done also allows for sharing common sets of options (for example, many commands have options that look like the ones the log command uses). The options description allows the dispatch module to check the given options for any command, and to convert any values passed in to the type expected by the command function. Almost every function also gets the ui object and the repository object to work with. One of the things that makes Mercurial powerful is the ability to write extensions for it. Since Python is a relatively easy language to get started with, and Mercurial's API is mostly quite well-designed (although certainly under-documented in places), a number of people actually first learned Python because they wanted to extend Mercurial. Adding new commands can be done simply by adding a hashtable called cmdtable to the extension module. This will get picked up by the extension loader, which will add it to the commands table considered when a command is dispatched. Similarly, extensions can define functions called uisetup and reposetup which are called by the dispatching code after the UI and repository have been instantiated. One common behavior is to use a reposetup function to wrap the repository in a repository subclass provided by the extension. This allows the extension to modify all kinds of basic behavior. For example, one extension I have written hooks into the uisetup and sets the ui.username configuration property based on the SSH authentication details available from the environment. More extreme extensions can be written to add repository types. For example, the hgsubversion project (not included as part of Mercurial) registers a repository type for Subversion repositories. This makes it possible to clone from a Subversion repository almost as if it were a Mercurial repository. It's even possible to push back to a Subversion repository, although there are a number of edge cases because of the impedance mismatch between the two systems. The user interface, on the other hand, is completely transparent. For those who want to fundamentally change Mercurial, there is something commonly called "monkeypatching" in the world of dynamic languages. Because extension code runs in the same address space as Mercurial, and Python is a fairly flexible language with extensive reflection capabilities, it's possible (and even quite easy) to modify any function or class defined in Mercurial. While this can result in kind of ugly hacks, it's also a very powerful mechanism. For example, the highlight extension that lives in hgext modifies the built-in webserver to add syntax highlighting to pages in the repository browser that allow you to inspect file contents. There's one more way to extend Mercurial, which is much simpler: aliases. Any configuration file can define an alias as a new name for an existing command with a specific group of options already set. This also makes it possible to give shorter names to any commands. Recent versions of Mercurial also include the ability to call a shell command as an alias, so that you can design complicated commands using nothing but shell scripting. Version control systems have long provided hooks as a way for VCS events to interact with the outside world. Common usage includes sending off a notification to a continuous integration system or updating the working directory on a web server so that changes become world-visible. Of course, Mercurial also includes a subsystem to invoke hooks like this. In fact, it again contains two variants. One is more like traditional hooks in other version control systems, in that it invokes scripts in the shell. The other is more interesting, because it allows users to invoke Python hooks by specifying a Python module and a function name to call from that module. Not only is this faster because it runs in the same process, but it also hands off repo and ui objects, meaning you can easily initiate more complex interactions inside the VCS. Hooks in Mercurial can be divided in to pre-command, post-command, controlling, and miscellaneous hooks. The first two are trivially defined for any command by specifying a pre-command or post-command key in the hooks section of a configuration file. For the other two types, there's a predefined set of events. The difference in controlling hooks is that they are run right before something happens, and may not allow that event to progress further. This is commonly used to validate changesets in some way on a central server; because of Mercurial's distributed nature, no such checks can be enforced at commit time. For example, the Python project uses a hook to make sure some aspects of coding style are enforced throughout the code base—if a changeset adds code in a style that is not allowed, it will be rejected by the central repository. Another interesting use of hooks is a pushlog, which is used by Mozilla and a number of corporate organizations. A pushlog records each push (since a push may contain any number of changesets) and records who initiated that push and when, providing a kind of audit trail for the repository. One of the first decisions Matt made when he started to develop Mercurial was to develop it in Python. Python has been great for the extensibility (through extensions and hooks) and is very easy to code in. It also takes a lot of the work out of being compatible across different platforms, making it relatively easy for Mercurial to work well across the three major OSes. On the other hand, Python is slow compared to many other (compiled) languages; in particular, interpreter startup is relatively slow, which is particularly bad for tools that have many shorter invocations (such as a VCS) rather than longer running processes. An early choice was made to make it hard to modify changesets after committing. Because it's impossible to change a revision without modifying its identity hash, "recalling" changesets after having published them on the public Internet is a pain, and Mercurial makes it hard to do so. However, changing unpublished revisions should usually be fine, and the community has been trying to make this easier since soon after the release. There are extensions that try to solve the problem, but they require learning steps that are not very intuitive to users who have previously used basic Mercurial. Revlogs are good at reducing disk seeks, and the layered architecture of changelog, manifest and filelogs has worked very well. Committing is fast and relatively little disk space is used for revisions. However, some cases like file renames aren't very efficient due to the separate storage of revisions for each file; this will eventually be fixed, but it will require a somewhat hacky layering violation. Similarly, the per-file DAG used to help guide filelog storage isn't used a lot in practice, such that some code used to administrate that data could be considered to be overhead. Another core focus of Mercurial has been to make it easy to learn. We try to provide most of the required functionality in a small set of core commands, with options consistent across commands. The intention is that Mercurial can mostly be learned progressively, especially for those users who have used another VCS before; this philosophy extends to the idea that extensions can be used to customize Mercurial even more for a particular use case. For this reason, the developers also tried to keep the UI in line with other VCSs, Subversion in particular. Similarly, the team has tried to provide good documentation, available from the application itself, with cross-references to other help topics and commands. We try hard to provide useful error messages, including hints of what to try instead of the operation that failed. Some smaller choices made can be surprising to new users. For example, handling tags (as discussed in a previous section) by putting them in a separate file inside the working directory is something many users dislike at first, but the mechanism has some very desirable properties (though it certainly has its shortcomings as well). Similarly, other VCSs have opted to send only the checked out changeset and any ancestors to a remote host by default, whereas Mercurial sends every committed changeset the remote doesn't have. Both approaches make some amount of sense, and it depends on the style of development which one is the best for you. As in any software project, there are a lot of trade-offs to be made. I think Mercurial made good choices, though of course with the benefit of 20/20 hindsight some other choices might have been more appropriate. Historically, Mercurial seems to be part of a first generation of distributed version control systems mature enough to be ready for general use. I, for one, am looking forward to seeing what the next generation will look like.